DNS Bank Recruitment Notification – Check Here Important Dates, Eligibility Criteira, Pattern etc. 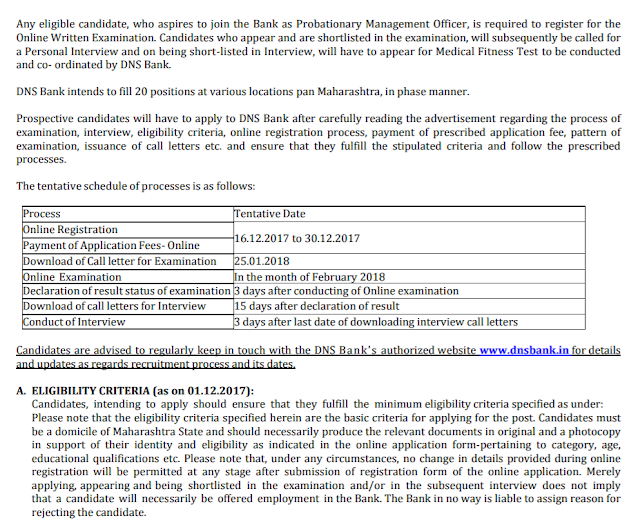 Dombivali Nagari Sahakari Bank or DNS Bank has released official notification for PO-MT Probationary Management Officers 2017-18. If you are Interested to join this Co-operative Bank as a Probationary Officer in Maharashtra State, Check below official Notification PDF. Last Date: 30th December 2017. Get Here Category-wise Total Number of Vacancies in DNS Bank for PO-MT Post. UR-09, ST-04, OBC-02, NT-02, SC-02, BC-01 Total 20. MBA or MMS Degree with certificate in computer literacy with should be able to read, write and speak Marathi. Age: min: 23 max 30 as on 01.12.2017.